Big Kay's burger joint was the fave hangout for the characters of The Wraith, even Packard Walsh and his gang got hungry and ate there. The restaurant was a drive in where you were served food in your car with a tray that hooked to the car door. The food was served to you by waitresses on roller skates. Jamie/Jake's brother Billy was the cook and Keri Johnson was one of the roller waitresses. It was your typical Burger and Fries restaurant. 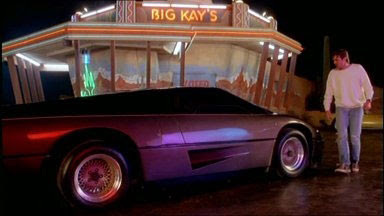 A lot of the scenes of the movie took place at Big Kay's.